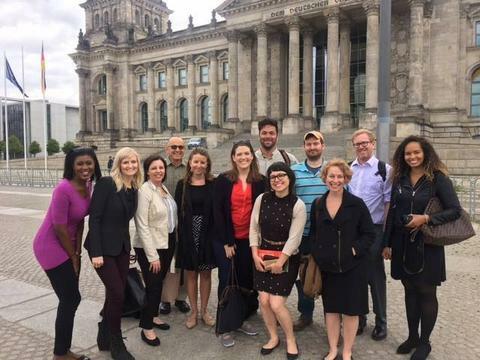 A two-month travel and work scholarship in the U.S. and in Germany for journalists not older than 35 years. 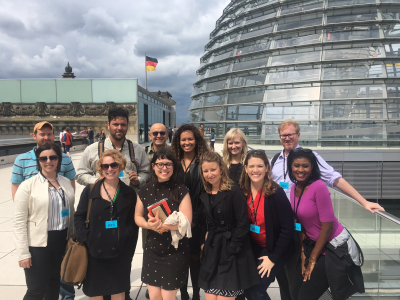 A ten-month journalist fellowship for a scientific and journalistic project in Berlin. 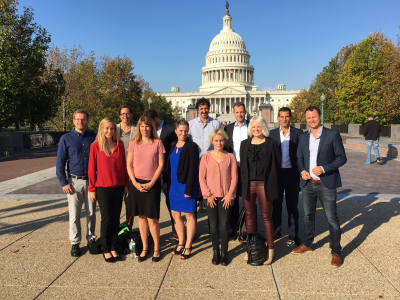 IFA regularly organizes Alumni-Conferences (runder-tisch-usa.de) for former participants of important German-American exchange programs. 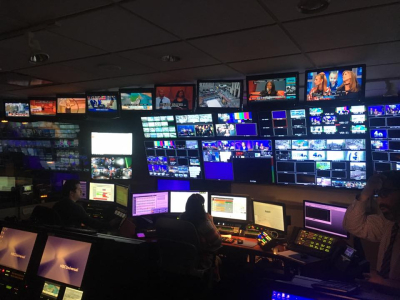 RTDNA, formerly RTNDA (Radio and Television News Directors Association), founded 1948, is the biggest and oldest organization of news directors in the United States. 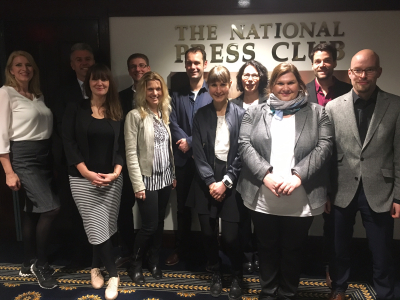 RTDNA publishes the monthly trade magazin “The Communicator” and hosts the RTNDA annual convention, dealing with a wide selection of important media topics and handing out the prestigious Paul White and Edward R. Murrow media awards. The Transatlantic Talks are a series of meetings of different personalities with transatlantic connections that take place every three months. It was set up on the initiative of Jürgen Graf. The aim of the talks is to discuss the current problems and future prospects for transatlantic relations and to fulfil a networking function in the transatlantic community in Berlin. Economic and trade conflicts in the transatlantic community. The Aspen Institute Berlin is beginning the third decade of its existence with a new and attractive programme designed to help it meet the challenges of the 21st century. 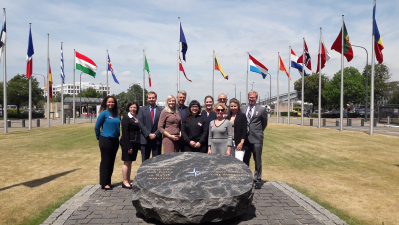 The touchstone for the quality of its work remains the remit it set itself when it was founded: to seek cooperative solutions for common political, economic and ethical problems within the European-American dialogue. As stated in its articles of constitution, the Atlantikbrücke e.V. (Atlantic Bridge), founded in 1952, seeks to strengthen understanding for Germany in the United States of America and Canada, and for the United States of America and Canada in Germany, and thus to make a contribution to German-American and German-Canadian friendship. The association pursues this aim with any means that seem appropriate. 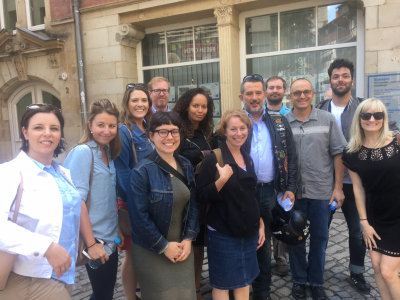 In particular, it funds and arranges personal encounters between Germans and North Americans or Canadians in the economic, political and cultural centres of those states. The association also carries out public relations and information work. It works on a friendly basis with individuals and institutions that have similar aims and fulfils any obligations that may arise from this cooperation on a case-by-case basis. The post of coordinator was set up in 1981. It has been held by Karsten D. Voigt since 1999. The coordinator reports directly to the Federal Minister of Foreign Affairs. His job is to pursue the development of German-American cooperation, in particular in the field of inter-societal exchanges, culture and information, to ensure harmonisation of activities in this field, and initiate activities that give concrete form to this cooperation, especially in the area of governments, parliaments, mediatory organisations, academic institutions, NGOs and the public. The aim of this is to consolidate and expand existing German-American and transatlantic networks. When Karsten D. Voigt took up office, the coordinator’s mandate was extended to include Canada. The aim of the Checkpoint Charlie Stiftung is to foster German-American relations, paying special attention to the role of the U.S.A. in Berlin from 1945 to 1994. 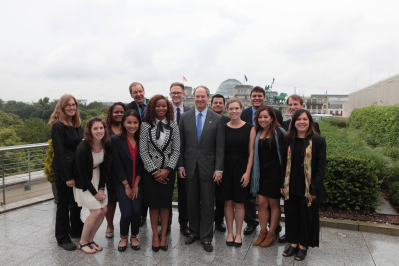 The foundation’s purpose is implemented particularly through symposia, discussion groups, encounters between citizens of the two countries and through the promotion of articles that deal with the cultivation of German-American relations. The foundation plans its own activities and on request also sponsors external projects. 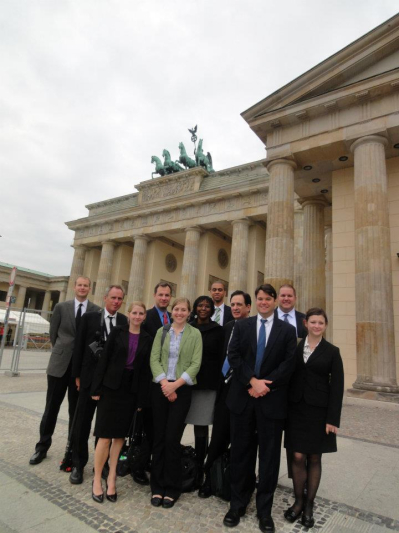 It is commissioned by the Berlin government to run the German-American exchange programme for teachers, known as STEP. 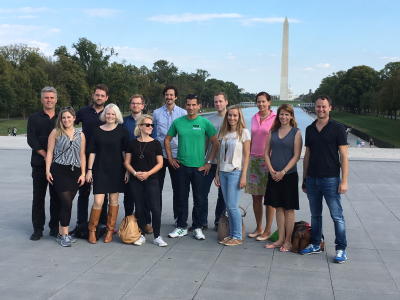 The Berlin-U.S.A. initiative is the largest German-American member organisation in Berlin: some 450 Berliners have joined this organisation in order to cultivate lively and friendly relations with the U.S.A. in the form of encounters and programmes in the city. Their largest single project is the “Youth Bridge” — a programme that has been running 1987 and is designed to enable Berliners, Americans and Canadians between the ages of 18 and 25 to spend two weeks with host families and get to know each other and the partner countries. The Dräger Stiftung, which has its headquarters in Lübeck, was founded in 1974. 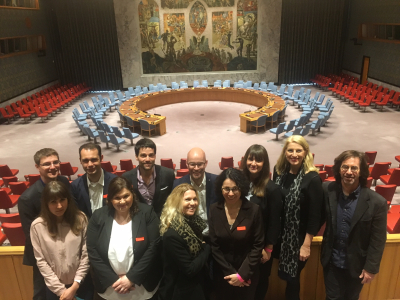 Since the beginning of the 1980s, the foundation has been working for the continuity of transatlantic relations. The foundation is concerned not just with relations between Germany and the United States, but also with European-American relations. Since the fall of the Wall, Eastern European countries have been increasingly incorporated into the dialogue.International conferences on various topics are organised in conjunction with American partners. 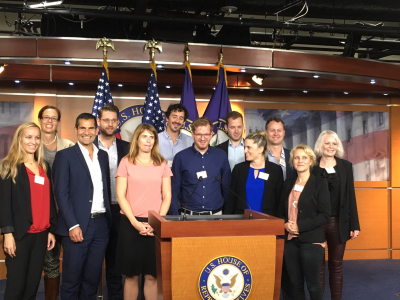 As part of the exchange programme, young German and Eastern European executives have been able to gain deeper insight into what is happening on the political, economic, social and cultural scene in the U.S.A. Joint Study Groups look at some of the most pressing problems of our times. 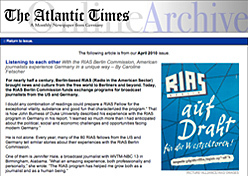 In accordance with the agreement signed on 19 May 1992 by the governments of the Federal Republic of Germany and the United States of America, the RIAS BERLIN COMMISSION promotes the exchange of persons and information between the two countries in the field of broadcast journalism. 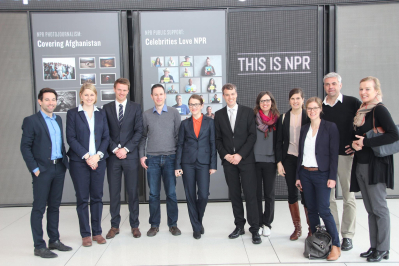 Information trips to German or the U.S.A. for radio and television journalists from both countries are at the centre of the commission’s activities. 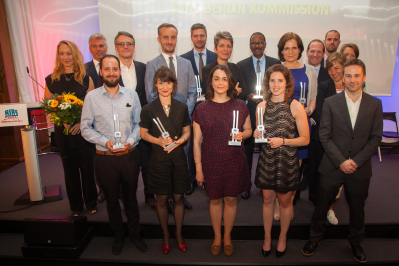 By awarding production subsidies and an annual radio, TV, and New-Media prize, the RIAS BERLIN COMMISSION supports those radio and television programmes that make a particular contribution to German-American understanding. The State Legislative Leaders Foundation was formally organized in 1972 at the height of the legislative reform movement that swept across the United States. As the SLLF expanded its scope of educational offerings it also broadened its board membership to include up to 45 sitting state legislative leaders and an Advisory Council made up of representatives of 60 leading businesses and corporations. In 1999, the SLLF announced the creation of SLLF/Europe, a new subsidiary organization dedicated to bringing key European parliamentary leaders together to examine public policy issues of mutual interest. 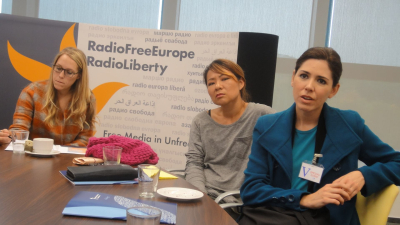 Additionally, this European initiative seeks to establish new lines of communication and cooperation among European parliamentary leaders and also with their American counterparts.